Sister Rita Ferschweiler has been defying expectations since the day she was born in St. Louis, Oregon. The doctor didn’t expect her to live, but her grandmother kept baby Rita until she grew strong. This year Sister Rita marks her 100th birthday and her 75th year as a Sister of Providence. She was the eldest child on the family farm near Gervais in the Willamette Valley and has spent her life caring for others in nursing, hospital administration and pastoral care. Her longevity is a gift from God, Sister Rita believes. “I have had excellent health all my life. I worked in a lot of hospitals, but I never have been a patient.” She no longer climbs trees to pick fruit for the sisters, but each day she exercises, walks a mile, weather permitting, takes the stairs rather than the elevator, and chooses an apple over a donut. 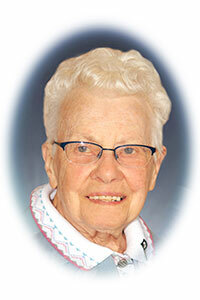 She met the Sisters of Providence while working at St. Vincent Hospital in Oregon, after graduating from Mount Angel Academy and working on the farm and a cannery. She entered the religious community in 1943, made her novitiate at Mount St. Vincent in Seattle, and professed first vows in November 1944. After training at St. Elizabeth Hospital in Yakima, Washington, she served primarily as a medical-surgical nurse in Seattle, Fairbanks and Anchorage, Alaska, and Yakima. She received a bachelor’s degree in nursing from Seattle University and then was sent to St. Louis University for a master’s degree in nursing service administration. Sister Rita arrived at Portland’s oldest hospital, St. Vincent’s, as a nurse in 1956 and then was director of nursing services. After becoming its administrator in 1964, she guided construction and the move to St. Vincent’s new 451-bed hospital and medical center. She left St. Vincent’s in 1972, the last Sister of Providence to serve as an administrator of a Portland hospital. She served in ministry at St. Peter Hospital in Olympia, Washington, at Mount St. Vincent in Seattle, and later on the Provincial Council. She eventually returned to Portland, living on the Providence Portland Medical Center campus and continuing her volunteer ministry to patients, serving on boards and reading books for visually impaired people. Sister Rita moved to St. Joseph Residence in Seattle in the fall of 2011. She’s had her share of accolades, including being named by The Oregon Journal as one of Oregon’s ten women of accomplishment in 1971. But her joy comes from relationships and helping others, including reading each day to Sister Inez Arkell or to others with failing eyesight. She enjoys living with the sisters and is happy to have one sibling left, a brother from Mount Angel who came to Seattle for her birthday celebration.